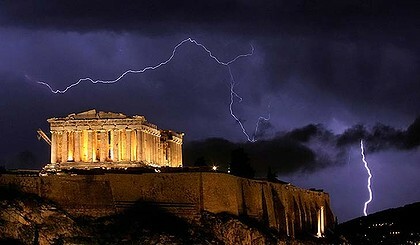 Far too long, financial vampires in Europe and North America have had free access to the open veins of the Greek people. Little blood is left, but still the vampires want more. This is how they live, in castles called the IMF, the European Commission, the European Central Bank. They call their brutal regime ‘austerity,’ but its true name is insatiable, murderous greed. 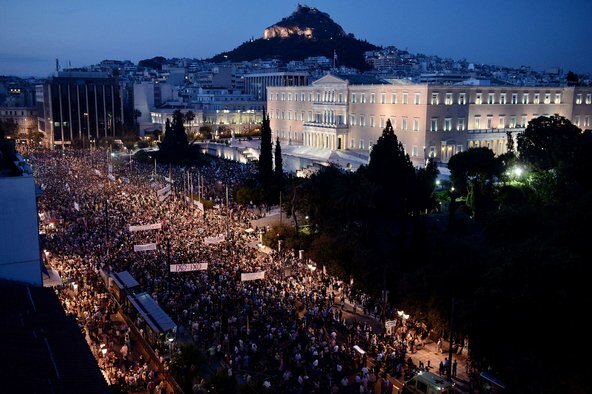 Athens rally, June 2015: Yes to freedom, no to austerity. Photo: NY Times. The vampires hate the new government. They set about immediately to discredit, paralyze and ultimately to smash it. An example must be made, subjects must be reminded of their place. In power six months now, the Greek government has tied itself in knots trying to meet the insatiable demands of the vampires, while still keeping its promises to the people who elected it. Finally this past week it could no longer yield any further without cravenly betraying them. Instead it asked the people of Greece to decide for themselves how to proceed. Tomorrow, Sunday July 5, Greeks face a stark choice between two extremely painful paths, both imposed from outside. One path is to accept more of the same from the vampires, the other is to refuse them, and face the vicious retaliations that will surely result. It’s a horrible decision that no one should ever have to make. It’s a forced decision that people in other parts of the world also face, and very likely many more of us will have to face in the future. This won’t be the first time Greeks have been forced to fight for their freedom, even their survival, against enormous odds. In April 1967, backed as usual by the CIA, Greek army officers launched a coup against the elected government. The military junta immediately abolished civil rights, dissolved political parties and exiled, imprisoned and tortured politicians and citizens who resisted, opposed, or even questioned them. For most Greeks it was a nightmare, but the vampires thrived. On February 21st, 1973, law students went on strike against the military dictatorship, barricading themselves inside the Law School of the University of Athens. They demanded the repeal of a law that imposed forcible military drafting on “subversive youths”, a fate already suffered by 88 of their peers. The police were ordered to attack. By chance, I happened to be there. Circling the Mediterranean on a quest of sorts, that afternoon I was heading for the Acropolis. On a downtown building I noticed young people at the edge of the roof, holding up a banner in Greek. On the streets below, swarms of buses gathered, their flanks and windows painted dull grey. Men in uniform spilled out, clubs and guns on their belts. Streets emptied, shop doors slammed shut. Soon young people started disappearing from the roof. After awhile they emerged from the main entrance, staggering, choking and gagging – from tear gas, I assumed. They were forced through a gauntlet of police, who beat them with clubs. I saw and heard the impact on heads and backs, saw people hurled like sacks of grain into buses, caught glimpses of more beatings inside. On streets I watched ordinary looking men suddenly pull out small clubs from inside their jackets, beat young people, apparently at random, then run away. Here and there a shop door opened and hands pulled in a fleeing refugee. Behind other doors, people shook their heads, Go away! That first uprising at the Law School is often cited as prelude to a much larger one in November 1973 at the Athens Polytechnic. Though it too was put down with even greater brutality, it sparked thousands of workers and youth to join protests across Greece. In July 1974, the military dictatorship collapsed. Four months later, national elections were held, the first in seven years, won by the conservative New Democracy party. Fatefully, one of its first priorities was to seek membership in the European Community, formed only a few years before. The same forces I witnessed that day in Athens are still at work today. Now they wear suits. The uniforms and thugs stay in the background, to be called up as needed. Now the preferred weapons of mass destruction are international finance and trade agreements, negotiated over our heads and behind our backs. Like other dictators the finance vampires hide behind a veil of fake legality, to kill and destroy with impunity, smug in their ruthless power. So long as these vampires continue to rule, by deception and force, people everywhere will continue to face the kind of torturous dilemma that Greeks face tomorrow, and worse. For the people of Greece I wish the clarity of vision to see through the propaganda and threats that assail them, and the courage to refuse the vampires. Categories: Civil disobedience, Corporate, crimes against humanity, Economic, Ethics, Events, Government policy, Human Rights, International finance, International law, Justice, nonviolent resistance, Population control, Propaganda, Protest, Resistance, Uncategorized | Tags: Athens Polytechnic, austerity, CIA, Colonel's regime, corporate agenda, coup, coup d'etat, Ethics, European Central Bank, European Commission, European Community, Greece, Greek referendum, IMF, international trade agreements, military dictatorship, New Democracy party, resistance, Syriza, University of Athens, vampires | Permalink. Google? Use at your own risk. A longish (10 – 15 minute read), eerily fascinating fragment from Julian Assange’s new book, When Google Met Wikileaks. In this excerpt Assange documents his bizarre encounter with Eric Schmidt, CEO of Google, one of the most powerful managers of information – our information – on the planet. Eric Schmidt, Google CEO. Photo: Business Insider. “I began to think of Schmidt as a brilliant but politically hapless Californian tech billionaire who had been exploited by the very U.S. foreign-policy types he had collected to act as translators between himself and official Washington. How wrong Julian Assange was, and how tightly enmeshed Google is in the US national security apparatus, he documents in meticulous, chilling detail. Here. Or here. But all is not lost. There are alternatives to Googlism, created by people who value freedom – the real thing, not the flags-and-guns kind – over profit and power. For common sense on options, check out the Electronic Freedom Foundation’s Surveillance Self Defence Index. Categories: Bold Scientists, Corporate, Current affairs, Ethics, Google, Government policy, Internet freedom, Media, Population control, Propaganda, Social media, Surveillance, Technology, Uncategorized | Tags: Big Brother, corporate agenda, David Lyon, Electronic Freedom Foundation, Eric Schmidt, Ethics, Google, Julian Assange, population control, Surveillance, Surveillance Self Defence Index, technology, When Google Met Wikileaks | Permalink.